Set on 1 floor with wooden-beamed ceilings and terracotta floors throughout, the accommodation is fresh and airy but retains a traditional feel. On the ground floor, the entrance opens directly into the kitchen area. on the left dining area with double sofa bed. The kitchen is fully equiped with all you nedd. Opposite the entrance a stair take you out in the pretty outside space, equiped with wooden chairs and table. The bedroom face Alpi Apuane and Castelvecchio Pascoli, land of Giovanni Pascoli. En suite bathroom to bedroom 1 with bath, wc, shower and bidet. DVD/MP3 player and double sofabed. Cooker, fridge, washing machine, microwave, oven and kettle. Cosmoplitan Country Club, 18 holes in Tirrenia 65km. Tirrenia Golf 9 holes in Tirrenia. Notes on accommodation: Heating must be paid locally 15 euros per day. Utility Room: Iron/ironing table. The apartment was exactly what we wanted - great location (as long as you’re happy with a few hills). Luckily we had a family member with a small car who drove us into Barga Vecchia with our bags after we had parked nearby. Fabio was very helpful and accommodating, he made it really easy for us to check in as we arrived later than expected. Definitely recommended! Thank you so much, very appreciated! excellent, right in the middle of the old town. We come to Barga every year and use the family home but due to circumstances we had to rent an apartment this year. It was spotless, great balcony, beds all comfy, lovely white fluffy towels and bbq. We had a fabulous time in this charming little apartment. It was perfect for 2 people and great value. We have stayed in Barga many times before but this has so far been the best accommodation we have stayed in and it was nice to stay in the centre storico for a change. The owners were absolutely lovely and gave us helpful recommendations for our stay. My only point would be that anyone who had any walking difficulties it probably wouldn't be for you as it is perhaps a 10 minute uphill walk from any car parking and if you travel as I do with everything but the kitchen sink it's quite a way to drag a case but with it :-). Thank you Fabio we will most definitely be back!!! We stayed for 2weeks in this apartment. Very clean on arrival and comfortable. In a good position for both old Barga and the new part. We would certainly use Fabios apartment again. Perfect apartment in Barga old town. Quaint apartment in the old town. The apartment had everything needed for our stay with two children. The rooms were large and airy, prefect to keep cool in August. We loved the location, which suited us perfectly as we were attending a family wedding. The views from the apartment were fabulous and the area around quiet. I highly recommend this apartment and will definitely be back. Fabio was on hand if we needed him and communicated quickly and efficiently when booking the apartment. This apartment is perfect for couples or a family, with the added bonus of a terrace to enjoy the views whilst having breakfast. Thank you very much. Your review is very important for us! 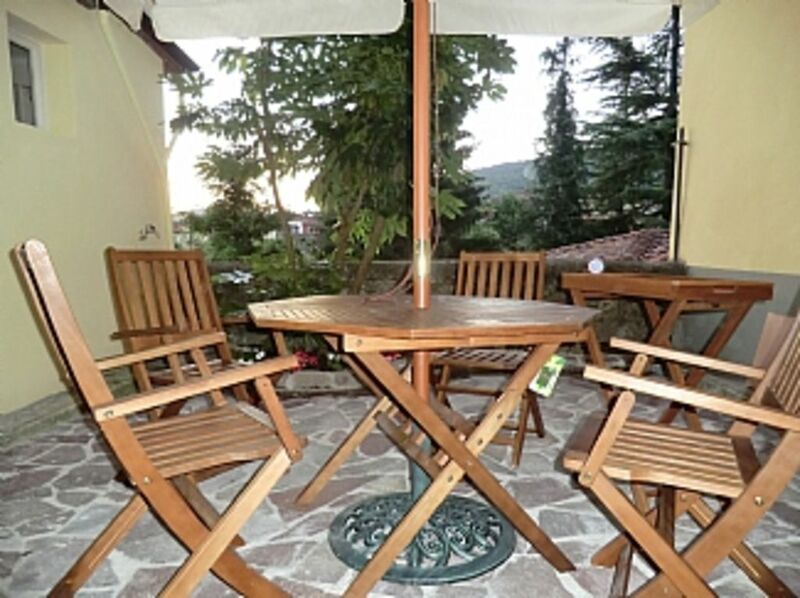 This is a lovely property, situated right in the middle of old Barga. The apartment is tastefully decorated and provided us with all that we needed for the 10 days we stayed there. I was especially thankful for the washing machine but although there was an iron, I couldn't find an ironing board. We seldom ate there, choosing to patronise the many restaurants in the area, but had we chosen to 'self cater' cooking utensils were available to use. We stayed there in the hight of summer and the apartment, with its marble floors stayed cool throughout and the patio at the rear of the property provided good shade. Overall, we were very happy staying at Fabio's pleasant place and booking the property couldn't have been easier. I would certainly reccomend this property for anyone who wants to explore this beautiful part of Tuscany. Pisa is the nearest airport 65km. The nearest train station is Fornaci di Barga at 6km. From the station it is possible to reach Barga by taxi. Bagni di Lucca 15km, Castelnuovo Garfagnana 25km, Lucca 30km, Pisa 60km, Florence 90km. Inside the historic centre there are many restaurants all good and cheap, In Via di Mezzo a little grocery can solve any problem. A big Leclerc supermarket is in Gallicano at 10km. No problem with bank and ATM. In the main square of the new town close to the restaurant "Alpino" you can find 6 banks within 50m. An other ATM inside historic centre have beeen activated just in front of the "Ristorante Scacciaguai"